Sorry for the lack of posting lately. I have been busy working camps. 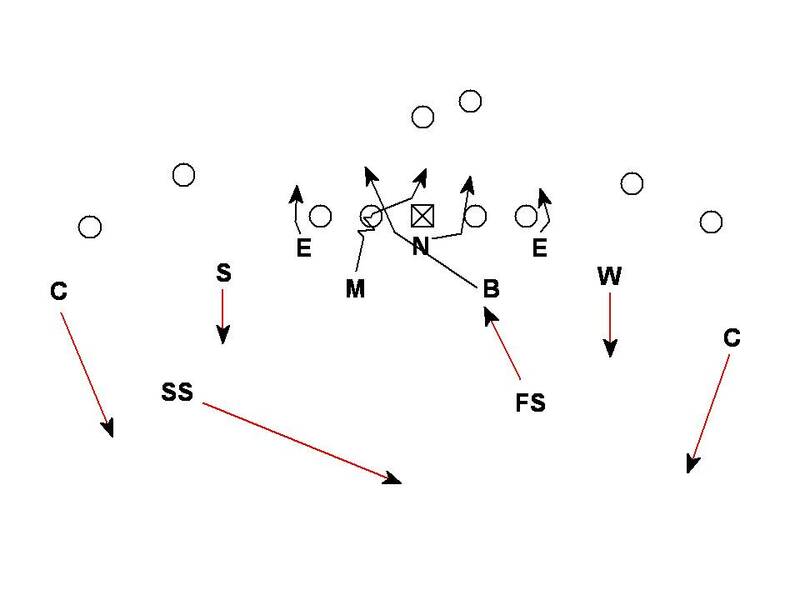 This week's Blitz of the Week is an X blitz by both inside linebackers in a 3-4 with fire zone coverage. The timing and spacing of the Inside Linebackers and the Nose are the critical coaching points to this pressure. This blitz is most effective vs. offenses with wider splits. If the slide is going to the blitz the Center is in a bind as the Nose goes away the blitzing Bob shows up in the A gap area the Center is responsible for in the slide. This is where the Bob must work to the widest part of the A gap to pull the Center out wider. The Mike should attract the attention of the Guard with his alignment and the dance. If the Bob is timed up on his blitz, the Mike should have a clean run on the midline. If the slide is going opposite the blitz the Center is stretched with the Nose and the Mike should have the same open rush on the midline. vs. BOB this blitz can be effective vs. all three types of BOB mentioned in the previous post. If the 2 inside linebackers are the responsibility of the OL the Center and Guard must handle a difficult twist by the blitzers. If the OL is responsible for 1 inside and 1 outside the protection is just like the 1/2 slide example. 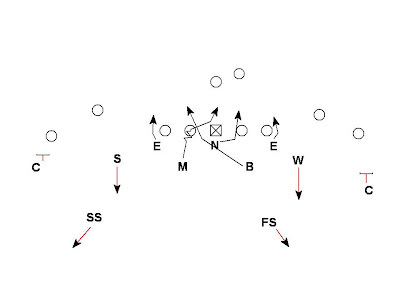 Lastly, if the OL has both the outside linebackers the blitz will force a hot throw. 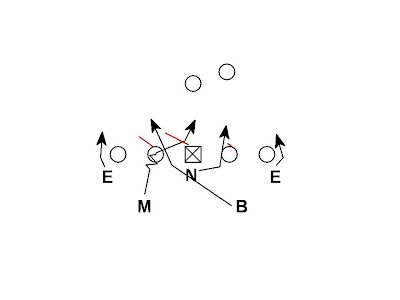 This blitz can be used successfully vs. zone read as well. If the blitz is opposite the alignment of the back the center must block the blitzing Bob linebacker in the inside zone scheme. 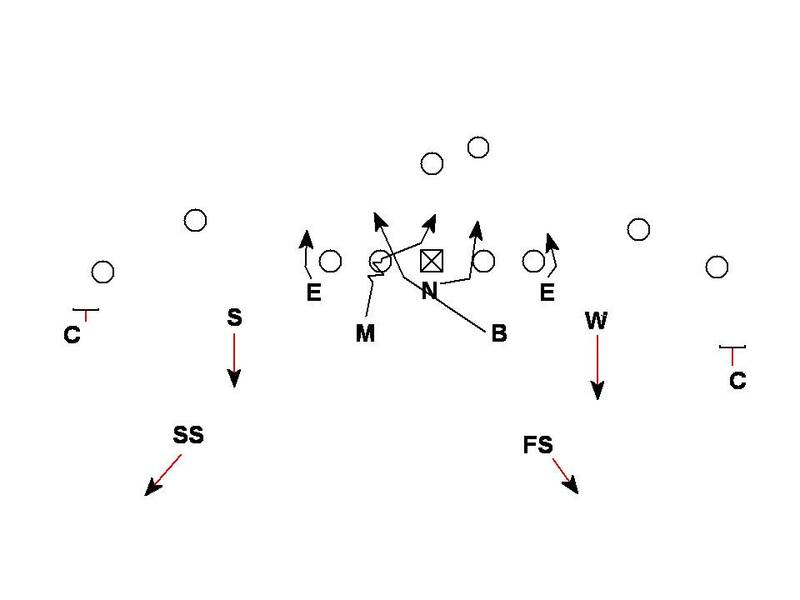 The blitz of the Bob linebacker and the block of the Center should push the Bob into the initial path of the back which should cause the RB to cutback. If the Mike has done his job he should be coming over the top at the same time the RB is cutting back and be unblocked to make the tackle. 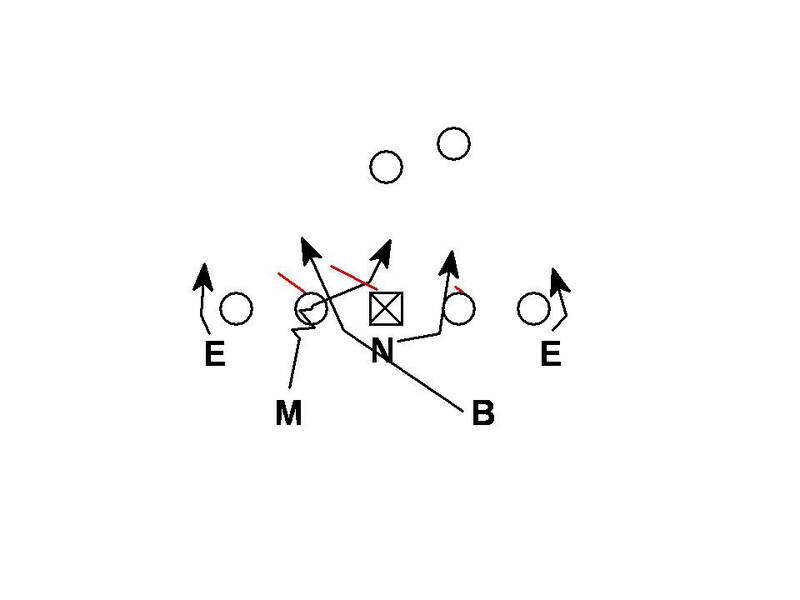 This blitz can also easily be converted to a 4 under 2 deep pressure. 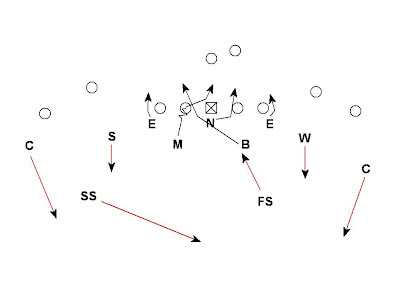 Nice blitz, we've run something similar out of the 3-5-3 and from a 4-2-5, crossing the middle backer. Are you running this in passing situations only? Originally it was only a pass pressure but we had success vs. the run with it in spring so we may give it a go next season.